On May 6, 1998, Kerry Wood made his 6th major league start and he would do something only one other pitcher had ever done up to that point, striking out 20 men in a 9-inning game. It was an incredible accomplishment for someone so young and raised the bar so high that there have been times it almost seemed too high. 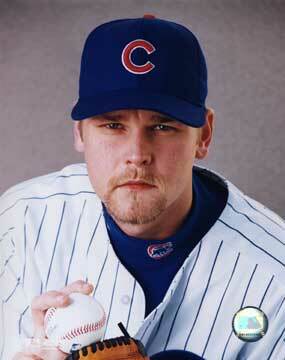 Yet Kerry Wood has remained a down to earth, humble country boy to this day. After growing up in the same area that produced Nolan Ryan and Roger Clemens, Wood was drafted by the Cubs and arrived in 1998 amid a great deal of hype. 1998 would be a memorable year for the Cubs in general. Along with Woods 20 SO game, Sammy Sosa would be locked in an exciting home run battle with Mark McGwire all season. There would be a great pennant race, with the Cubs battling for the wild card down the stretch. Wood would win 13 games and the Rookie of the Year award. The Cubs would win the wild card, though Woods contribution in the play offs against Atlanta would not keep the Cubs from losing in 3 games. After the season, however, Woods unconventional mechanics would force him to have surgery that caused him to miss the entire 1999 season. Ever since then there has been a debate as to whether manager Jim Riggleman overworked the young pitcher, however if you were to carefully watch Woods unusual style you would have to question whether it was the pitcher himself. After a tough 2000 season Wood would return to win 12 games in 2001 and 2002, then in 2003 he would come into his own in helping to lead the Cubs to a division championship, winning 14 games and leading the NL in SOs. Wood played in key role in getting the Cubs to the league championship, however, he would also lose the 7th game that saw the Florida Marlins move on, despite a home run by Kerry. Over the next 4 seasons, a series of injury issues derailed his career as a starting pitcher. In 2007 he became a relief pitcher. In 2008 he became the Cubs closer and helped get the Cubs to the division title. However, after being unable to help the Cubs get past the first round, Kerry made a decision that stunned Cubs fans by choosing to leave the team in free agency to join the Cleveland Indians where he pretty spent a year and a half struggling. But following a late season trade to the Yankees, Wood seemed to be revitalized and played a key role as a set up man in getting the Yankees to post season. Then following the 2010 season Kerry Wood was still debating where to go next when a tragic turn of events would lead him back to the Cubs. On December 3, Cubs icon Ron Santo passed away after an illness. Wood had grown close to the Cubs broadcaster and future Hall of Famer and decided to come back to Chicago for the funeral. Following the funeral, Kerry had a chance to talk to then GM Jim Hendry and Hendry convinced him to return to the Cubs. So Wood returned in 2011 and became the set up man for Carlos Marmol, though there were times it looked like Wood should be the closer instead. He was very effective in that role. Kerry Wood is one of those rare baseball stars who is clearly not interested in being in the spotlight and will give of himself in the community. His foundation raises funds for worthwhile charities and he has been known to go out in the community with his children to well known local eateries, like there is this diner near where I live in Des Plaines, Illinois that is called the Choo-Choo which is famous around the area for having a railroad theme with toy trains that serve food and I recently found out that Wood has visited it with his kids. Okay, its just a diner, but I think its cool that he thinks of himself as just another parent taking care of his kids. Like I said, he seems like a down to earth person and not just a baseball player. My guess is that he will retire soon and find a way to remain in the Cub organization much like Billy Williams and Ron Santo. Maybe he was not a Hall of Fame player, but he is truly a Hall of Fame person and we should feel lucky to have him. I figured since I did a tribute to my father on the anniversary of his passing, I might as well do one to my mom on the anniversary of her passing.